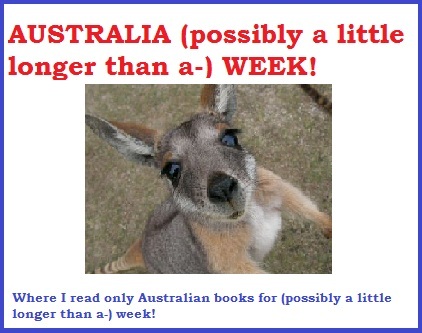 AUSTRALIA (possibly a little more than a-) WEEK! Guys, I have some exciting news. Wear the Old Coat is going to be partaking in AUSTRALIA (possibly a little more than a-) WEEK. See? I even have a highly artistic button that I didn’t just make in two minutes on MS Paint. I’m not going to put what date I’ll be reading and reviewing my chosen books because it’s not really a thing and I’m highly disorganised I’m not exactly sure when that will be. BUT. You’ll be pleased to know I have actually chosen the books I’ll be reading. AND the order. And because I know you’re all itching to get started with the Aussie goodness and it physically hurts to wait until Monday… I’m going to be inadvertantly racist and draw on every cliche I know post some of my favourite things about Australia! Many a weekday afternoon did I spent watching this programme on Channel 5 when I was supposed to be getting a degree. FUN JO-RELATED AUSTRALIA FACT: Dr Karl Kennedy came to our SU in first year to play his music and my friend got her ticket signed. HE CAN PLAY THE DRUMS with freaky disembodied arms AND SAVE LIVES. HE IS MARVELOUS. I refuse to believe that Australians don’t offer vegemite sandwiches to strangers and dance around in the outback like crazy kids playing music on bottles while wearing lycra. FUN JO-RELATED AUSTRALIA FACT: I’ve never had a vegemite sandwich but I don’t like Marmite. And saving the best until last. Look at the denim over the shoulder coat. LOVE. FUN JO AUSTRALIA-RELATED FACT: I hate karaoke but after about twenty a few sambuca shots I found myself being dragged up on stage with my friend and sang (Well.. I say sang…) the following song in front of a bemused Chinese family and about fifty Stag Dos. The moral of this story: DON’T DO SAMBUCA KIDS. IT RUINS LIVES. So, until Monday… enjoy some wallabies having a cuddle. Great idea… and great little additions on this post. I loved neighbours when I was younger!! « Under the Mesquite- Guadalupe Garcia McCall.